In September of 2017, I had the honor of writing a musical review for Tell Me by Nothing But You, Nicky. The Japanese songstress has a unique style and relishes in the traditional forms of voice. Nothing But You, Nicky’s approach to music is filled with elegance, grace, and originality that is reminiscent of legendary artists like Prince and Whitney Houston. Nothing But You, Nicky gives honor to the genres of alternative and contemporary music by giving her audience a performance that they will surely relish. Recently, I had the blessed opportunity to ask Nothing But You, Nicky a few questions about music and her life as an artist. Enjoy! Kiyomi Ishii, popularly known as Nothing But You, Nicky is the music world’s new rising star. Warlock Asylum: Thank you very much for taking the opportunity to answer a few questions and share some of your insights about life, art, and music. Please introduce yourself. Who is Nothing But You, Nicky? Nothing But You, Nicky: Thank you for having me! I love to share my life story with you all. My name is Kiyomi Ishii and my stage name is Nothing But You, Nicky. I was born and raised in Japan. When I saw Whitney Houston’s performance on video in my 20s, I immediately felt that music doesn’t need different languages. Music can touch someone’s heart in a special way. I fell in love with Whitney and her singing. I decided to become like her so that I can help others. I had been working as an office lady to make money and used my resources for learning and performing music in Japan. At age of 36, I decided to move to America to learn English and study music in pursuit of my dream. I had been working so hard as an office lady in America too and never stop learning and singing at the same time. Now my dream is coming true. Warlock Asylum: How did you discover your passion for music? Was it something that was always with you or something that developed later in life? Nothing But You, Nicky: At age of 3, I started to play my house organ by ear and sang as if I were a superstar. Closing my eyes and sang from bottom of my heart for hours even though they were children’s songs, lol. I guess I was born to be a performer. Warlock Asylum: Who are some of the musicians that you admire and played an influential role in you freely creating your own style? 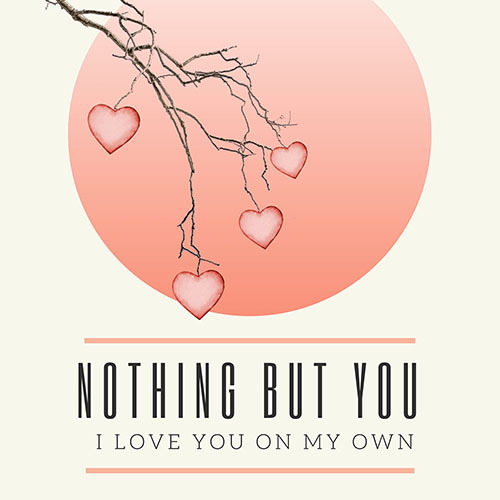 Nothing But You, Nicky: Whitney Houston, Celine Dion, Lara Fabian, and Ella Fitzgerald to name a few. Warlock Asylum: Being born and raised in Japan, how difficult was it for you to adjust to American culture? Did you ever have any doubts about coming to America in pursuit of your musical career? Nothing But You, Nicky: It was not hard. I assimilated pretty fast. Especially since the Japanese Society in the San Francisco area is huge and very warm so I felt so comfortable. I never had any doubts about coming to the United States because this was my only dream and I have deep admiration for where Whitney Houston lived. Warlock Asylum: What obstacles did you have to overcome to make your career what it is today? Nothing But You, Nicky: At one time the hardest part of my career was doing interviews on radio shows because everything is in English. I was so worried, but once I got over it I would like to do more, even television! Warlock Asylum: We are very excited about the release of your new album I Love You On My Own. How is this album different from your earlier works and what is the overall theme of this title? Nothing But You, Nicky:Thank you!! This album “I Love You On My Own” is my first original album ever. I definitely feel like I tried to soften myself on the first album because of the producer. Of course, I love the album and it’s really good, but I just don’t think there’s enough soul in it and I wanted to get that back. So on this album, I’m like, I’m a singer’s singer, I’m going in. I’m doing it. The biggest difference with the new music is that it’s really celebrating the most important thing to me, which is my voice, I honestly feel like I’m coming into my own, and really want to be remembered forever. This album is all about Love!! My composer Emine SARI and my lives and love are in all songs. Life is not easy but includes good and bad times making our lives better and stronger. We hope our music resonates in the hearts of all mankind. Warlock Asylum: After hearing some of the songs, I must say that I find your work to be impressive. to say the least. What do you expect to achieve with this new album? Nothing But You, Nicky: Ooohhh! Love to hear that! I believe music is the best tool to connect people’s hearts as one. This new album would give me so many opportunities to meet people from around the globe and share in happiness together. Everyone needs love and peace and if we can do that, this world will be a better place. Warlock Asylum: What can we expect to hear from Nothing But You, Nicky in the future? Any final thoughts? Nothing But You, Nicky: I always love to perform live, so please come to one of my shows. I will be there and we will make this world a better place for everyone. *Thanks for sharing a portion of your life with us! On behalf of Warlock Asylum International News I would like wish all the best in pursuit of your artistic and musical endeavors. Looking forward hearing more good news from you in the future. Blessings! Why Is The Government Interested In Warlock Asylum’s Upcoming Book On the Simon Necronomicon And Ninzuwu Practice? The Atlantean Necronomicon Part II?